This is really strange card. For this to shine you really need to build deck around. You definitely want to draw minions with a very strong immediate impact on board. 1 mana Mecha'thun would be bonkers, you don’t really care about Jan'alai, the Dragonhawk stats, having rag for 1 mana would be awesome. 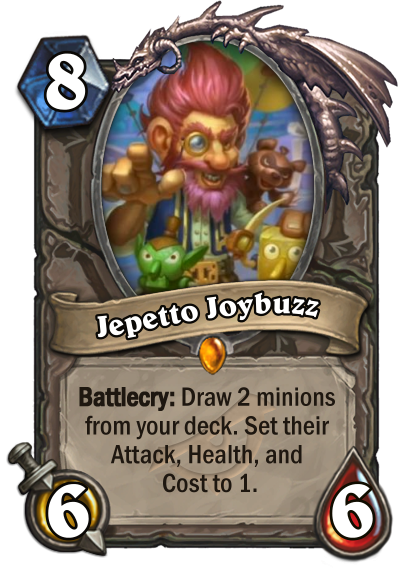 On the other hand Jeppeto cost 8 mana, so you can already afford high cost late game minions. As for now I don’t think this is a good card. It can shine only with amazing high roll, and how often would you pull it off? Huh, the battlecry seems to target VERY strong late-game Deathrattle/Battlecry minions. But if you're already on turn 8+ why would you want these to become 1 mana 1/1s? Strange card. togwaggles scheme on malygos then play this? I don't know how this card is going to be used but combo decks seem like the only possibility. Now i think it is time control got some more actual dirty rat level disruptors. Yay more otk.. malygos + toggwaggle' scheme then this.. you either go for luck with a buffed up scheme or you only run malygos. why didn't malygos got hof'ed again? Draw 1/1 Malygos or Mechac'thun or Antonidas or any other combo piece. I watched the korean stream and in the video they mentioned Malygos and Mech C'Thun. Perhaps there might be some way to utilize him in these kinds of decks. Problem is you can draw these card before you can play this card. Given this card 8 mana high chance of that will happen. Yeah but you have more ways to achieve the combo if your mechathun or malygos cost 1 and have 1 1 stats. Interesting card, but we will see if there will be any strong combo deck that would be happy to run it. I am so sure we all gonna see a lot of rage for this card and the OTK combos it will create. Love it! I hate these kinds of cards as they either work and are awesome or you draw the cards you want to cheat out easier before you get to play him - it will clearly see play in some OTK decks and ill be there laughing when it doesn't work or being salty when it does. You just solved the problem I had with this card - damn ill be sad if OTK will be strong yet another year. I am so sure we all gonna see a lot of rage for this card and the OTK combos it will create. Hate it! It might be run in some OTK decks? 1 mana malygos? You dont play these cards because of stats, its because of the card text.